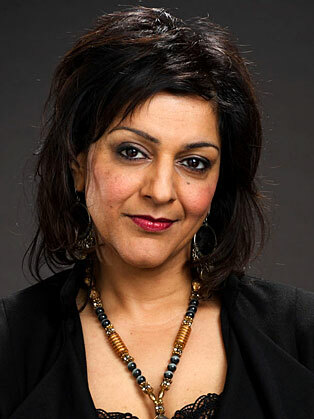 Born in Wolverhampton in 1962, Meera Syal's career began as a voiceover artist on the experimental documentary Handsworth Songs. This led to work in a number of productions ranging from factual series through to comedy and features. The author of two novels, Anita and Me and Life Isn't All Ha Ha Hee Hee she received an OBE in the Queen's Birthday Honours in 1997. During the '80s, Syal presented Sunday East, a magazine programme targeted at the British South Asian population, and wrote scripts for comedy series Tandoori Nights. In 1987 she appeared in the feature film Sammy and Rosie Get Laid and the BAFTA-winning series, The Little Princess. Syal's career has flourished since the 1990s, with roles in drama series Kinsey, Holding On, Keeping Mum, In Deep and Fat Friends. Her screenwriting credits include BBC thriller My Sister Wife, A Nice Arrangement and the screen adaptation of her novel Anita and Me. However, it is for comedy that Syal is best known. She honed her comedy acting skills on the sketch show The Real McCoy and went on to write and act in award-winning shows Goodness Gracious Me and The Kumars at No.42.